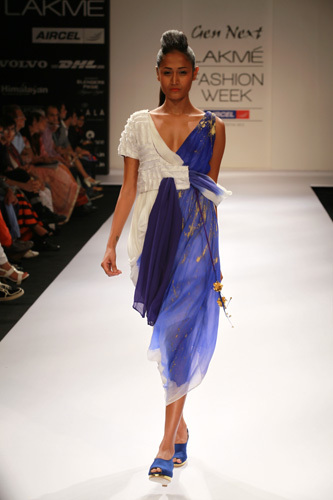 Lakme Fashion Week kicked off on Friday Aug 3, 2012 with a beautiful and creative display of fashion from the Generation Next category. These newbies did a great job, below are a few that stood out to me. Very different from the other shows, Aniket Satam's collection is a gorgeous mix of textures and fabrics with a very bohemian-Indian inspired feel to it. 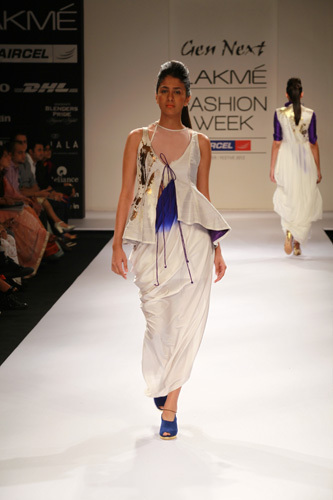 I love the colours in this collection and the way the fabrics draped over the body. I do think though that this collection would have suited a Summer/Resort show much better. Not so sure about this collection. I like the structure and fitting in this collection, but I am a bit confused with the inspiration. It seems to have a mix of both the Orient and tribal India. What do you think? 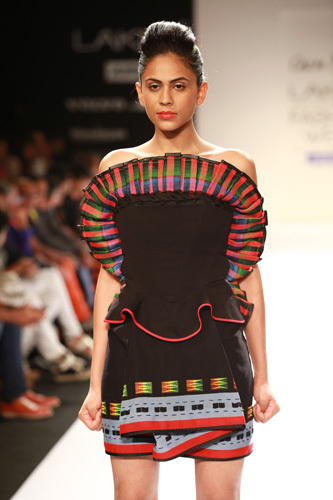 Love this eclctic nerd inspired collection by Sneha Arora. Great styling, great layering, great use of fabrics- I would wear quite a bit of this! I feel very inspired after watching this show.